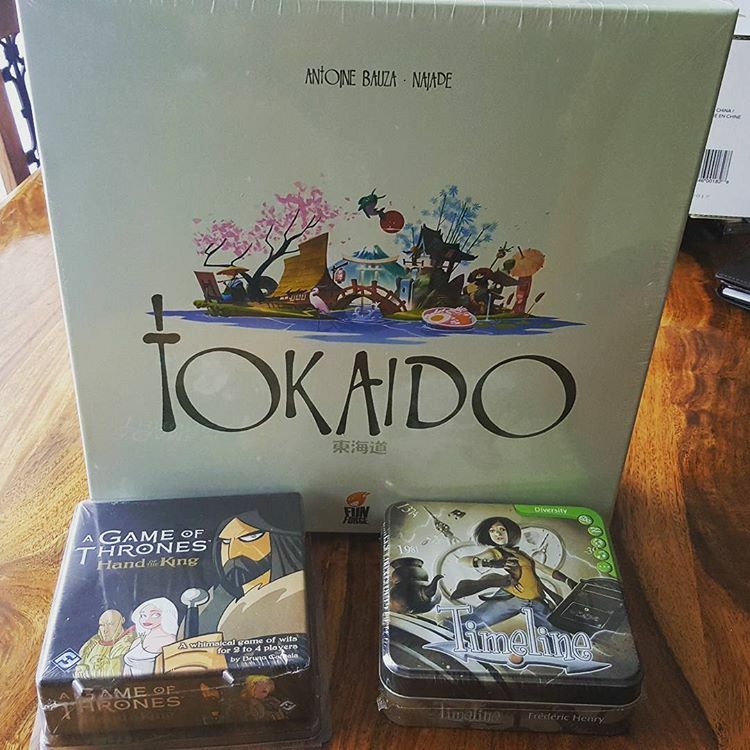 Tokaido - This week's purchase also made it's way to the table right away. I was actually a little excited about this having wanted it for a while and it would have to definitely be a contender for best board game box art for me. Having only played this online, I finally got around to playing the game how it was originally designed in both 2 and 3 player games this week. Two player was more to test it all out and make sure I had all the rules sorted - which I've gotta say it could be one of the most simple games I have, and the three player game was actually giving it a good go. I did manage to win both games which is always a cherry on top, but regardless I was pretty pleased to have another good looking easy to teach and play game in the library. This one won't be played a heap but for those casual nights I can see myself sneaking it onto the table. Takenoko - What better game is there to follow Tokaido? Straight from Japan to China with not only another good looking game, but one by the same designer Antoine Bauza. Both good games, but I think Tokaido wins in art as well as the 'chill' factor where there is virtually no stress in the game (as long as you can eat), whereas Takenoko takes it for cutest playing pieces and actual gameplay. Both great games nonetheless and somehow I barely snuck out a 2nd win of the night. Not sure why I don't play Takenoko as much as I'd like to as I do find it enjoyable. Klask! - I might stop writing about this one as I can imagine it being played nearly every week for the next little while. Besides, technically its more an activity than a board game even though you buy it at a board game shop and it's listed on boardgamegeek. Another new player in a what turned out be best of 12 match. Although it only lasted 6 rounds as I won every one. In the end my opponent was claming it was all luck - I'll admit luck plays a big part like it does with most games, however I'm not sure if luck is the right word to describe beating someone 6 games straight.. There's gotta be some skill involved right? Tokaido - As I mentioned this is one I had only ever played online. I knew what I was getting due to my online plays and that is a relaxing game with beautiful looking simplistic art. Lot's of white and lots of colors really make this game pop. The basic concept is that your having a holiday across Japan over a few days and you want to enjoy it the most by spending your time relaxing in hot springs, eating expensive food, going shopping, meeting new people and visiting temples. It's a great game for those looking for something simple and its often likened to the kids classic Candy Land. To be honest I've never played Candy Land, but I get the idea it's very linear and straight forward. Game Of Thrones: Hand Of The King - Not the epic Game Of Thrones game that everyone claims to be an absolute delight - instead I went for the simpler easy to get out and easy to play edition. To be honest I've actually given this game away as a birthday present, but then again I've never seen Game Of Thrones so it seems to make sense not to have the game. Hope to try it sometime though! Timeline: Diversity - Just another pack of cards to add to the Timeline board game. I haven't played it in a while, but I'm sure it'll be played a fair bit in the years to come so a few more cards to mix things up certainly doesn't hurt. I haven't had a good look at this one, but don't think it focus's on a certain topic but is just a mix of everything which makes it one of the best editions to mix in with all the others. Holidays over and back to normal until Christmas! 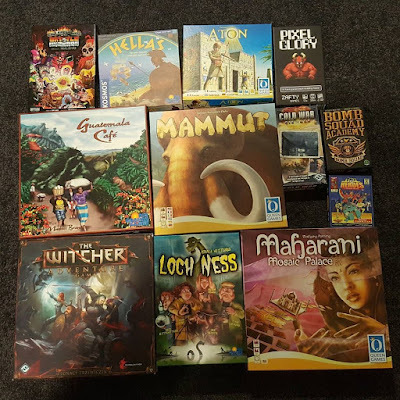 Not a whole lot of gaming the last couple weeks with all the travelling and holidays with my grandparents - but I did manage a few games here and there..
Klask - Spoiler alert to a new purchase for the week. I decided to play Klask! Is it even a board game? Most likely not.. It's more of a dexterity game, but one you'd find in a board game shop and it's a lot of fun! Four ways to score a point - get the ball in your opponents 'hole', get two of the three small magnets from the middle of the 'table' onto your opponents magnetic paddle, cause your opponent to lose magnetic control of their paddle and lastly my favorite - cause your opponent to 'Klask' by getting their paddle into their own goal. It's fast paced, a little like air hockey but pretty different as its all done with magnets as opposed to air. And the extra ways of scoring offer something fresh. 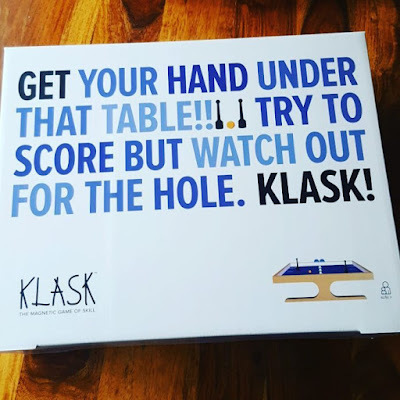 As I said, its an activity not a board game, but if you like air hockey then I'd definitely suggest you give Klask a go! Kingdomino - Purchased fairly recently, I finally got to see what all the fuss about this award winning game was all about. Is it amazing? No, not at all. It's just a simple accessible game that anyone can pick up and play easy. It all makes sense, the rules are easy to grasp, its bright and colourful and its a good puzzle of a game. With so many games garnering the library now, I can see myself playing Kingdomino more in the future mostly because of its pick up and play nature, where a game can be started without the need of re-reading the rules after a long absence from the table and the fact games are about 10 minutes long. I'm not blown away, I've enjoyed the few games I've played. Codenames: Pictures - I enjoy the creative challenge of the original Codenames but haven't felt the need to venture into one of the now many options of ways to play. Undercover, Pictures, Duet & the soon to be released cash-ins like Disney etc are bringing this popular game to the masses, but while good for the more casual mainstream audience, those with cupboards that include a plethora of games I'm not convinced they warrant the space if you already have the original. That was my opinion going into a game of Pictures (played at a friends house), and after playing four rounds which I really enjoyed - I have the same opinion. It's good, but the original is the standard that all other twists are based on and its really all you need. Pictures in some ways introduced some creativity but it most ways I found it stifled things a little. It seemed easier to draw comparisons to link pictures based on shapes, sizes and similar types of objects in the pictures. Linking words in my opinion requires a greater effort but also offers a far more pleasing feeling of satisfaction as your team nails the exact abstract far left of field clue you gave them. If you don't have a version of Codenames - just get one. Pictures might be a little more accessible but I enjoy the challenge of the words more and don't see the need for both. Klask - Aside from having a pretty ordinary looking box, everything else about Klask is pretty cool. Really how else can you describe a smaller version of a game that's closely related to Air Hockey but has some fun and innovative ways to change the game with the use of magnets. Is their skill? Well I guess there has to be, with trick shots, defensive vs aggressive plays and all the usual other things that come into play when playing a game like air hockey - but mostly I think it's just good old fashioned mindless fun where occasionally things pay off for you but mostly its just random luck and hitting a ball around. Don't let that put you off though! I don't mean that as a negative as even when you lose you know you can play better and you'll be regretting silly errors you made like when you 'Klask' yourself! I'm extremely happy with this purchase and look forward to challenging different ones and definitely expect to get some good wear out of this brilliant activity/dexterity game! A bit of a delayed post this week as I've spent the last week on holidays in the Gold Coast. While I did bring a few games with me, the holiday kept everyone pretty busy so we only had time for one game this week. Also I'll be on holidays again this weekend so expect another delayed post! Istanbul - It's been 7 months since I last played Istanbul. I really enjoyed it the last time I played and even went as far as buying box expansions (which are still perfectly sealed on the shelf), but for some strange reason haven't given Istanbul the opportunity to shine lately. That slightly changed on this holiday as it was the only game we actually had time to play. 2 quick games, one using the basic set up as we hadn't played in ages and the other game using the 'long game' selection for the bazaar. Both games were good and as I was playing I wondered to myself why I didn't play Istanbul more. It's a good game but I guess the big problem is because there's so many good games that its often been pushed aside for me. Not sure that'll change anytime soon as I've got too many unplayed games to get through - but I'll be back for more Istanbul eventually. Nothing - I was on holiday with limited luggage so unless something was amazingly cheap, I actually hadn't planned to buy anything. However there should be a couple games arriving tomorrow or Tuesday in the post.. Watch this space on next weeks delayed update. Celestia - Enjoyed this one a fair bit a month or so ago when we played, so couldn't resist the temptation to pull it out again with some different players. New group, same result. Success. Celestia has become my go to push your luck game. Easy to teach, easy to play, looks great, has an amazing ship component that while not necessary really adds to the game, and it's a lot of fun! There's a few little decisions and choices to be made, but its a game about luck so even when the dice and cards are stacked against you - nobody cares, it just adds to the fun! If you like Incan Gold / Diamont then I'd highly suggest Celestia. Similar games so possibly not worth owning both but even though I always push things too far and end up losing, with the fun I've had with Celestia I don't expect Incan Gold to be played for a little while. Tales & Games: The Hare & The Tortoise - While this seems like a repeat of a night I had when first trying Celestia and The Hare & The Tortoise, I actually wasn't intending to play both again in the same night. Like I said it was a new crew than before and I actually had Not Alone or Once Upon A Time in the selection of games I brought along that I was hoping to give a go. However this was voted on and so we followed the brilliant Celestia with The Hare & The Tortoise which basically had the same result as last time and fell a bit flat. There's nothing wrong with the game, but at the same time aside from some good quality production and looking the part, there's not a lot that really stands out? It's reasonably rated on BGG with a 7.2 and I get that its more of a kids game, but can't help but feel a bit of disappointment with this one. It's getting close to one that might fade towards the bottom of the pile shortly if a third play through ends with the same results. Hey, That's My Fish! - It's been in the collection for a little while, but I've only just gotten around to playing Hey, That's My Fish! Aside from all the punctuation when typing the proper title, there's not really anything bad to say about 'Fish'. I've read complaints about the set up which to be fair does take a little bit of time, but its an easy monotonous set up that can be done by a few people without thinking and fairly quick. So personally I'd say while a bit fiddly, the set up isn't an issue at all. Once the game is set up, your ready to out smart and trap your opponents in an effort to eat the most fish as possible! Each move you make the ice (game board) shrinks, leaving you less options and less fish to eat. It was described as 'the most chess-like game' we played that night, and there is a fair bit that goes into out playing your opponent, but it's done in a very simple manner and one that doesn't really matter too much if you make a wrong move. You just use one of your other penguins and try and do the same back! It's quick, fun, challenging and easy to play. All the makes of a good game that can be played both with kids and adults alike. In a way it's kinda more what I was hoping Tortoise to be.. Welcome To The Dungeon - Sometimes a second play or a different group can make a huge difference on a game. Of course such was the case with this weeks play of Welcome To The Dungeon! The first time I played this (maybe three months ago), I gotta admit I wasn't entirely fussed on it. To be fair it was a two player game and this time was with three of us - but what a difference it was this week. I really enjoyed this simple but strategic game of bluffing! There's a delicate balance between sabotaging your opponents by making the dungeon impossible and giving the impression of a sabotage so you can venture into the dungeon and reap its reward. It works really well and is such a simple but clever concept that I'm surprised I haven't actually played anything too similar before. A quick game is a good game as it means you can often play another round or move onto another game, especially when that game is just a filler before or after the main event. This game fills that spot almost perfectly other than the player elimination factor which might leave your opponents a little bored while waiting. What more can I say about Welcome To The Dungeon other than I look forward to playing it again and just hope I don't get eliminated first! Dominion - Still the only deck builder I've played, although I did acquire a new one this week. We played one round based on the 'Silver & Gold' set up and even though it seemed to last a lot longer than our other games - everyone was loving it. For a game with only some basic interaction, there seemed to be a lot happening this time and there was a lot of laughing going on. I didn't win, I didn't care. Dominion is slowly creeping up my list of favourite games and I haven't even ventured to the Intrigue expansion, which came with the game and I'm expecting will only add more fun and conundrums as I struggle to build the most epic deck! Okay so in theory it's not that exciting, but in reality it works. Will definitely be sharing the fun with more new players at any opportunity, and while it might not be the best game ever, Dominion has given me feelings of when I first started to play 7 Wonders. So there's a lot this week, but I'm not going to split it into multiple posts. These were bought off Gumtree as a package. I offered the seller $60 or 5$ / game for his lot of 12, knowing there would most likely be a fair amount of duds included but hoping for a gem or two. I won't say much about these games as realistically I think I had only heard of one of them before.. The Witcher: Adventure Game - This is the one game I had definitely heard of, but realistically I don't even know what I heard about it other than the name seemed familiar. Looks like a fantasy dungeon crawler type but I could be completely off on that. In typical Fantasty Flight fashion there are lots of little pieces, some nice artwork and mini's for the main characters which spice it up a little. Components wise this looks to be the bargain of the bunch and I expect I'll eventually at least give this game a go. Guatemala Café - A game about coffee. I don't drink coffee. Rio Grande Games, a bit older.. could be okay but I'm not entirely convinced. Lots of pieces and a fair bit of wood for an older game. Components remind me a little of Catan. Not in much of a rush to play this one. Hellas - A two player game from Kosmos and Rio Grande Games, I do enjoy a good game for two and I've been told this one is actually OK. Bit of a war theme, components are a mixed bag. The little soldiers and viking ships look decent but the art work on the lacks is pretty ordinary! Reckon this one will get played. Mammut - Queen games, interesting cover featuring a wooly mammoth that immediately makes me think an ice age/cave man theme. Nothing stands out in the components but they all look sufficient. Comes with a colourful little bag that holds all the animal tiles, but that could be a home made one that I've acquired. If the game is terrible I'll take the bag and add it to another game. Mammut looks to be one that I reckon I could easily get others to at least try. Hopefully its not a failure when we do. Maharani - Not sure how to pronounce that but the box art is giving me Indian vibes. 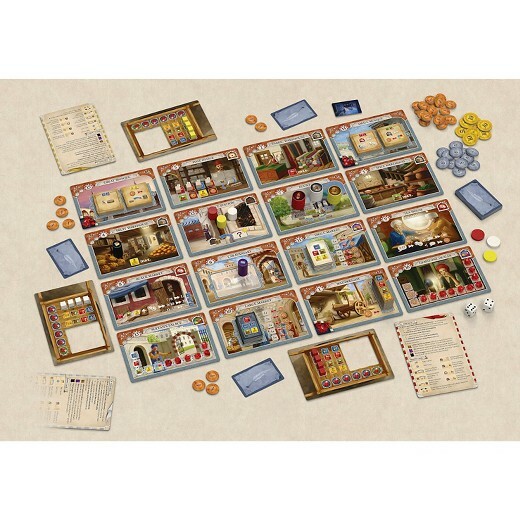 Another one from Queen games, this one has a fair few tiles and generic wooden pieces and colors. Nothing stands out but again it looks like one I'm sure I could convince others to try. If these all turn out to be average at best my credibility of bringing a game to the table could be ruined. Like the look of this enough to try it and it seems simpler. So far in terms of which games I'll most likely play first I'm ranking them: Hellas, Mammut, Maharani, The Witcher (only cause it looks like a long one) and Guatemala Café. Loch Ness - Bright, colourful and fun artwork might actually put this at the top of the to play list with these new games. Minimal components which gives the impression of a simpler game, this is another one from Rio Grande Games and features a cool Loch Ness monster meeple. I'd be surprised if I haven't had a chance to try this one by the end of the year. Epic Spell Wars Of The Battle Wizards Duel At Mt Skullzfyre - Terrible name so I won't bother typing it again. Epic Spell Wars appears to be more of a comical game then a serious one and by the looks of it the original owner might have gotten it as a gift. Its actually completely brand new with the card board not punched and the cards still sealed. I'll be honest, the cover art doesn't really appear to me. Most likely way off on this but first impressions are giving me a Munchkin vibe - think I rate this just about Guatemala Café in terms of games I'm looking forward to playing. Aton - Generic cover art with generic pieces, this older Queen Games release doesn't seem to have anything special going for it. Hopefully it's really fun because at the moment I'd rather play Guatemala Café making this the game I'm least excited to try. A few classics age well, this is definitely not one of them. Bomb Squad Academy - From TMG Bomb Squad Academy is definitely a game I'll try based on a few things. It's small, quick to play and bomb games often make for good tension. Fuse and Boom-o come to mind and this looks to be a bit of a mix between the two which could be a bit of fun for a little filler game. Reckon this might be at the top of the list now. Cold War CIA vs KGB - Featuring the most worn box out of the games that I purchased - this could mean that it's a good game or so bad it was often neglected with care. It's a Fantasy Flight game without a huge box, huge rule book and no mini's at all. I'm going to say this falls into the former and could be a sleeper hit out of the twelve I just bought. 2 player, America vs Russia, stakes are high and hopefully so is the tension and decisions. Really want to give this one a go but not everyone likes a more modern war theme so I'm not sure how I'll go finding someone to play it with me. Might investigate this one further on BGG and if the reviews are solid, I'll force it on someone. Pack Of Heroes - Small box, comic book style art and cards that are mostly black and white. Looks like a two player game that started with a good idea but wasn't unique enough to make an impact on the board game world. Not really that fussed on this one even though it falls into some of the categories that should in theory make it easy for me to find a willing opponent. Still not on the bottom of the to be played pile. Pixel Glory - My first thought when seeing this was Boss Monster. A fun and niche game but nothing mind blowing. What has me more intrigued is that the box says 'A fast-paced deck-building game'. With how much I've been loving Dominion, I'm pretty hopeful this could be good as well. Its brand new and never been played which could be a bad sign - but often board gamers can end up with a large pile of shame so it was nice for this owner to pass them on cheaply. Unfortunately for these games they've been passed onto someone who already has a gigantic pile of unplayed games and some will be relegated there. Pixel Glory looks to be one that will finally be opened.. but not for a while. I'm still enjoying Dominion too much to venture into a new deck builder! And that's a wrap. 12 board games that I basically knew nothing about and wasn't interested in until a 5$ bargain came along. Time will tell if it was a worthy investment or a waste of money - that mostly depends on whether I actually play this or not. I'm hoping I get to try some of them, but with so many good unplayed games sitting on the shelf it will remain a mystery for now. Timeline Challenge - While I don't mind playing the odd 'party game', more often than not I'd prefer to play a lighter filler game that involves some strategy or tactics as opposed to random guessing and acting dumb. They have their purpose though and are more often than not the first board games people play as they can be quite accessible. In my quest to have a board game for every type and occasion, a few party games have managed their way into the library. 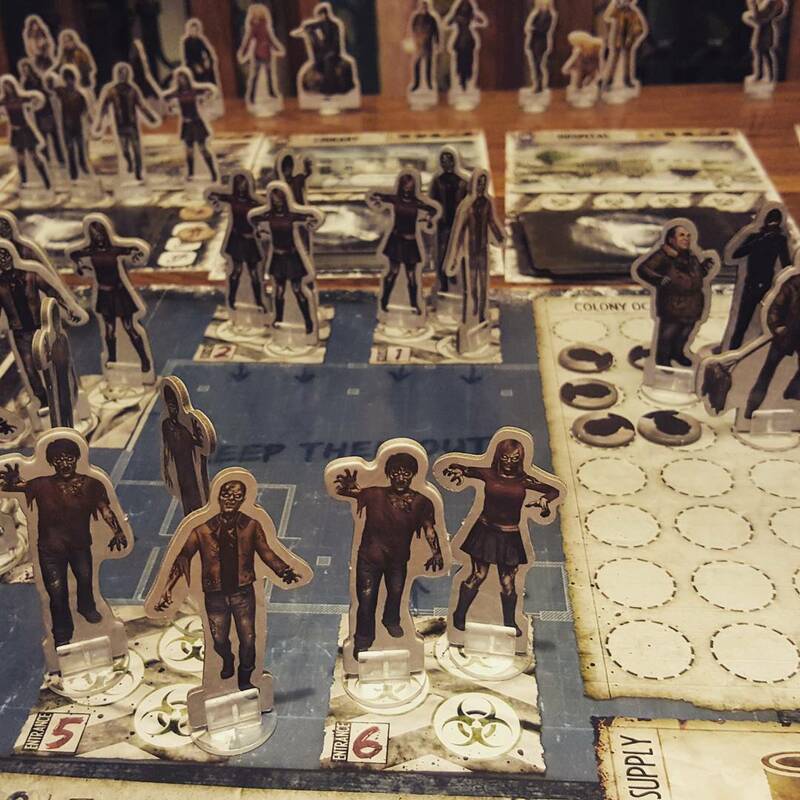 Telestrations, Codenames and Times Up! are the few that come to mind as being some of my favourites - but the few editions of the Timeline series that have been played have all been really enjoyed. A quick game is a good game. Epic journeys through an immersive game are also amazing experiences, but its the simple things that seem the easiest to sell to a group and actually get played. Timeline is one that I've never struggled with getting to the table. 'You got 5 minutes? Try this..' 5 minutes later, 'Can we play that again?'. Rinse and repeat. Timeline Challenge is the 'proper' board game version and after two plays in two weeks I'm just about ready to call it the definitive edition. It's the same thing, only longer and with more variety. It's an easy concept to grasp - guess the year this random event happened. Some you may have heard of, a couple you might even know the exact date, however most will fall into the category of 'I've got no clue but with a bit of deduction I can take an educated guess'. Those same factors are prevalent in Timeline Challenge and possibly even more as the different 'events' normally give you an easy chance to move ahead so you never quite feel out of it. It plays longer, but with the extra things going on I feel like Challenge will give you some extra mileage on your cards and it appears it will still be easy to get on the table. Takenoko - A few more plays of this beautifully charming Panda Japanese gardening adventure! Takenoko is great, and just the way it looks will be enough to allure most gamers. Not the deepest game and luck plays a factor, but there's enough you can do to try and help mitigate this. I've still only played this as a 2 player game so am looking forward to trying it with 3 or 4 soon. Zoomaka - Currently live on Kickstarter and about 50% funded. If you enjoy card games, Zoomaka breathes some new life into the genre by giving you options, actions and more to think about than simply playing one card every turn. You need to build and complete your Zoo before any of your opponents to win. To build your Zoo you'll need four exhibits filled with animals which are sorted into different types - animals with hoofs, animals that eat banana's, animals that fly etc. Each type requires a different amount of cards to complete an exhibit. Some animals have the advantage of belonging to two categories and there's also a couple rare chameleon cards that can slot into any exhibit. It's not just animals in your Zoo that you'll be focused on as you'll also need money for your Zoo. The currency 'Zoomas' is required to pay for action cards your opponents play against you, but to earn money you have to sacrifice one of the cards in your hand as well as an action. You can always gamble and hope your opponent won't play a card that forces you to pay, but if you have no money in the bank your zoo has to pay with its animals which end up straight into your competitors attractions. That's a quick summary of Zoomake, and if a card game about animals and a zoo, mixed with planning and strategy sounds enticing to you - then I'd suggest you go and back it now (link on the picture below). Personally, card games have never really been my thing and as such I've decided to pass on backing Zoomaka. I enjoyed it a lot more than traditional card games like Uno and Skip-Bo, but even with its stronger mechanics, Zoomaka is still a card game at heart. That's not a bad thing - especially if you enjoy card games, but it wouldn't see enough time on my table to justify a purchase. 7 Wonders & Cities - First game of the mighty 7 Wonders in nearly a year! We got our original gaming group back together on a sunday night and at the suggestion of one of the group, we went back to our roots for a game of Wonders. It took a quick refresh on the set up and about 2 minutes before everyone got back into it like we had never stopped playing. To make it simpler we voted on one expansion and Cities with its extra card each age, peaceful dove, debt and powerful black cards made the cut. Oddly enough, there wasn't one vote for the tower of babel expansion (and yes that was sarcasm as no one ever really knew what was going when we used to play it!). 7 Wonders used to feel intense, but this game was just fun and relaxing. The scores were all within about 5-6 points from 1st to 5th and I barely squeezed out a victory with a strong mix of victory points across all categories. Not sure when we'll play again. It could be a long while before our next Wonders session, but I know when we do get around to it, we'll all love and enjoy this classic once again. T.I.M.E Stories: A Prophecy Of Dragons - The last game for this two week, weekly recap is our third play through of the Dragons scenario for T.I.M.E Stories. Our first adventure through this episode was a 10/10 and possibly the most I've enjoyed a run through of T.I.M.E Stories, yet with each successive trial through the score has slowly been downgraded. I absolutely love the new elements and am excited about the creativity and effort that is consistently put into each scenario. Dragons played out like an RPG with spells, weapons, armor, potions, maps, thieves, warriors, wizards and everything else you'd expect in a fantasy setting. It also boasts the most non linear experience (of the 3 scenario's we have currently played), with multiple ways to conquer and challenge the quest to discover the Prophecy. That's what made the first play through so enjoyable, it was different and exciting, we were comparing characters and invested to try make them stronger and debated who's character was best suited for each task. As I keep saying, I loved the first play through. So what happened between the first and the third? Well the biggest problem with T.I.M.E Stories is also its biggest asset in making it unique. The time factor. Being constantly on the clock and trying to solve the mystery before time runs out, keeps the tension and pace high. Having to redo those things a 3rd time almost becomes a chore, especially when you've already made it to the very end only to fail - you've seen everything and know what's coming already. Your just going through the motions and the only real choices are what do we skip, what's not important and what is a trap. Thus our journey into fantasy became a game of memory and dice rolling. This is the same experience we had with Asylum and The Marcy Case, both of which also took us three runs to complete. The difference with Dragons is the story, or lack thereof. I can loosely tell you what was going on, but realistically we either somehow avoided it in our three times through or it was severely lacking on this episode. Both of the aforementioned scenarios, the resolve of the mystery and what was going on is what kept us engaged, but in Dragons we didn't have any sense of what was going on or even care to know. I love fantasy and all the rpg concepts included in Dragons were an absolute treat, but at the end the only thing I was caring about was making sure my character had the best gear I could, which wasn't enough to see me trek through a whole set of already played out locations. Maybe the T.I.M.E Stories experience is wearing thin? I disagree as I can't wait to head to Egypt, the ocean and the Knights Templar on our next few scenario's, but I'm hoping we'll find ourselves more invested in the stories as they unfold in the future. Scythe - Just the one game this week. We had a cancelled gamenight where we were intending to try out the soon to be kickstarted Zoomaka as well as try to complete A Prophecy Of Dragons on our latest T.I.M.E Stories quest. Those will have to wait until next week now, but we did manage to get another game of Scythe in which I'll never have complaints about. This time I went as the Red Faction (sorry I don't memorize the proper names) and used a strategy of controlling the factory and most of the tunnels to some how sneak out a victory. It was the first game where our popularity made it to the third tier which is always a nice bonus especially when 3 of the other players didn't. I do enjoy Scythe - lots to think about and it takes a fair bit for everything to come together well. Is it my favorite, the most amazing game ever? Definitely not. But it does a lot right and has plenty to sink your teeth into for a 2-2.5 hour game. Once Upon A Time - Truthfully I have no idea if/when I'll get around to playing this game, so in reality maybe it wasn't such a good buy after all. Impulse as usual, as I found it on gumtree for $10 and thought I'd add it to the library. 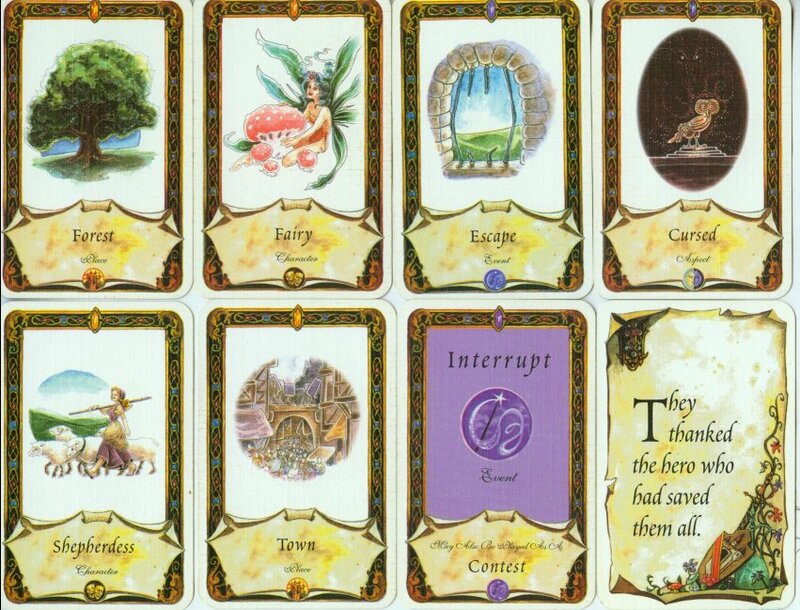 I don't really know much about this game other than that its a card game where you are trying to complete a fairytale and use all your cards before your opponents. Could be fun for a small diversion or it could fall incredibly flat. Feels a bit risky to pull out when there's other games I know will work well with whoever I'm playing with - but one day I'm hoping I'll be pleasantly surprised when I decide to give it a go.